Fires are one of the biggest concerns for restaurant owners and managers. However, with the right knowledge, the right practices, and the right services, you can have a business that is free of fires. The first thing you can do to prevent fires in your restaurant is to install an automatic fire-suppression system. 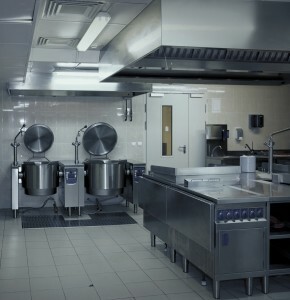 These is a crucial step because the majority of restaurant fires involve cooking equipment, but a fire-suppression system in a restaurant is designed to automatically dispense the right chemicals to deal with fires involving cooking oils and other materials found in kitchens. Just installing the automatic fire suppression system isn’t enough. You also need regular maintenance. How often you need to have your fire suppression system serviced will depend on a few factors, so always talk with a professional who understands the needs of your system and can make sure it is ready to put out any fire that comes around. Your exhaust system is designed to remove hot air from your kitchen and release it outside through a duct system. However, it also serves the function of removing vaporized grease in the air. This grease can build up in the duct system, and if it gets too hot, a dangerous and destructive fire can ignite. With regular cleaning, however, the chances of a grease fire in your ducts are significantly reduced. All of your employees, from top-level managers to newly-hired servers should understand the steps for fire prevention and suppression. Train them on the right practices to prevent a fire from breaking out, and make sure they understand what to do if a fire does occur. This training should include the use of fire extinguishers and when to evacuate the building. A clean area is one of the most proactive things you can do to prevent fires. Not only will it make your restaurant look more appealing to your customers, it will also reduce the chances of a fire from spreading. Make sure all combustible items are properly stored, and dispose of rags and other flammable trash in a container that is far from the kitchen. Clean up all grease spills thoroughly, and store flammable liquids in a puncture-resistant container that has been tightly sealed. Like the automatic fire-suppression system, your fire extinguishers will need to be serviced regularly as well. Working with a team that not only supplies fire extinguishers but services them as well will help you get everything you need for a safe, fire-free restaurant. Contact Flue Steam today to learn more about our reliable services. We can help you have a restaurant that is free of dangerous fires and air problems, so call now!